We all deal with trouble in different ways. I decided that I was going to get an image of every machine that got an image of me. I missed the first two,but now I'm determined. I posted the CAT scan a few days ago. 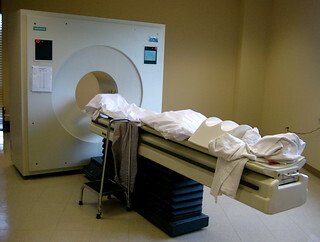 This is a PET scanner. A PET scan is a diagnostic procedure—a way to see inside the body without going inside. PET stands for Positron Emission Tomagraphy. Then the liquid travels thoughout the body. I couldn’t feel any sensation of this, and in fact, I just sat around in a comfy recliner and read for an hour. Then I lay on a table and got wrapped lightly in some material with marks on it. I lay still for about an hour while the table slowly slides through the scanner. Unlike the CAT scan and the MRI, there is no sound. The procedure is silent. The radioactivity emits positrons, which the scanner reads. Apparently, different types of tissues accumulate different amounts of radioactivity. Tissues that accumulate more of the material glow brighter. The machine records all of this, and then a specialist reads and interprets what shows up. Next week I learn the results of all this technology. These tests help explain the skyrocketing costs of medicine. However, they sure beat cutting someone open to peer inside.